Christmas Eve is traditionally our designated holiday to host, but with the end of this year being so busy for us, we were on the fence. 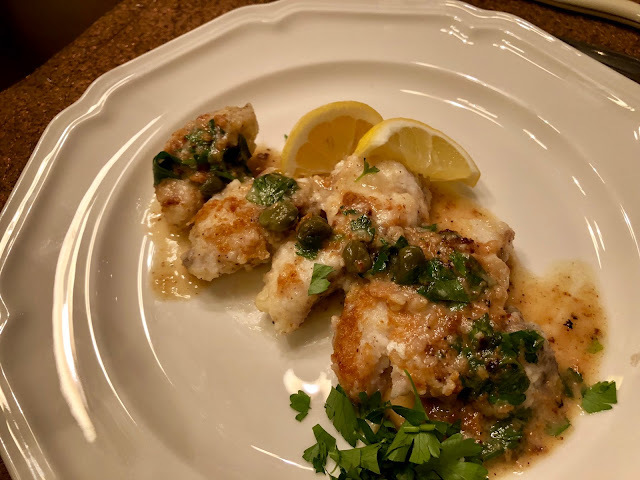 As it is my favorite holiday meal of all time, I found that I was quite saddened by the idea of not being in the kitchen making a big fish feast, in keeping with the custom of so many (mainly southern) Italian and Italian American households. 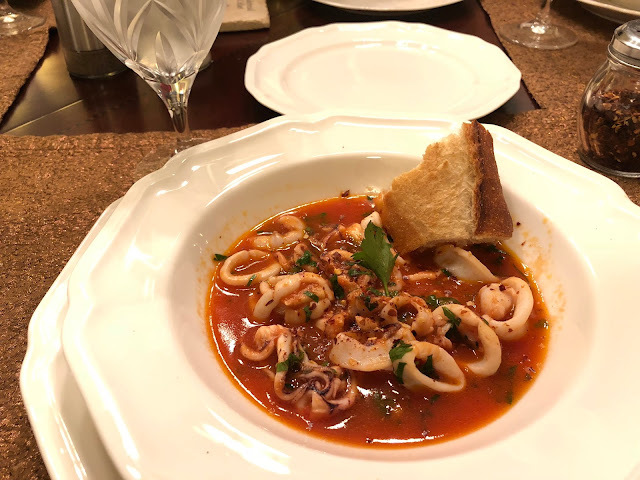 While I resolved that it would be too hectic to make seven fishes as normal, I was still very excited to choose two basic dishes that could be served to our small group of guests. Both dishes featured below can be made in less than 20 minutes once prep is done. 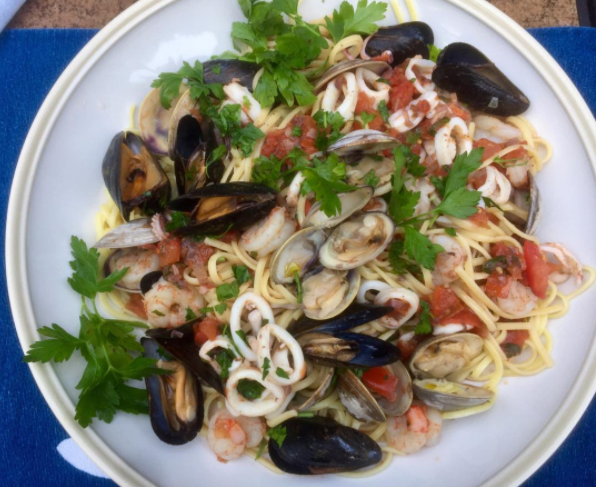 Do click through some of our more involved (but never difficult or unduly time consuming) Feast of the Seven Fishes menus below, but I hope today's post gives you some great ideas for your next fish-driven dinner party or family meal. 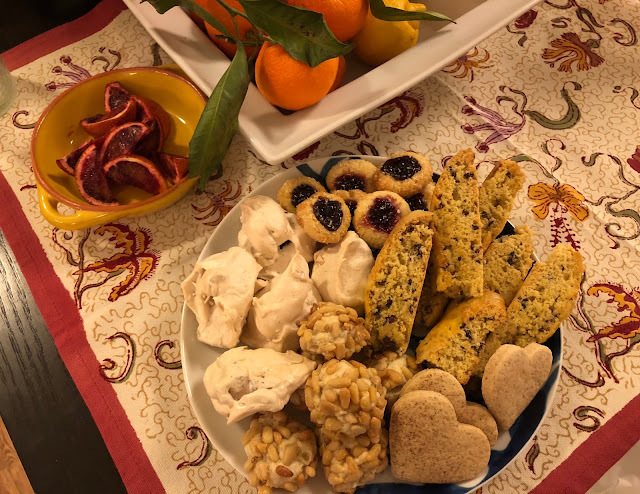 For Dessert: Using the selection of Christmas Cookies we'd already baked and serving them alongside high quality store bought Gelato was a fas solution. I've featured all the recipe to links to this year's Christmas Cookie Assortment below. Five varieties to choose from may sound daunting, but the baking was made easy and achievable by spreading it out over a few days (freezing some of those made in advance helped us immeasurably). The key is also to choose easy, foolproof cookie recipes, sticking to those that require minimal prep, ideally less than 15 minutes. I hope you enjoy and that the holiday season brought happiness and peace to your home. We look forward to returning to our usual menu program next Christmas Eve! The holiday season is in full swing, and though this is the most busy time for some, it's actually a bit slower in our household, believe it or not. The preceding months were absolutely action packed, and try as I might, I did not get to do nearly enough blog-worthy kitchen experimentation. Every holiday season, I attempt to add another cookie to my highly selective baking repertoire (find two of our other favorites HERE and HERE). As a prerequisite, the recipes I repeat must be both very easy to master and predictable in outcome. Nothing bothers me more than doing everything exactly the same and getting a less than stellar result, but such is life with baking, and that's why to this day, I will always prefer to cook. This year I have had a bit of an inexplicable thing for shortbread (all my life I had no idea it was so easy to make, often with only 3 ingredients in the dough! ) so Ina Garten's Shortbread Jam Thumbprints drew me in almost immediately. After one test run for half this large-batch recipe, I was convinced that it was totally foolproof. A baker I am not, but I know a good cookie when I taste one. You'll find the link to the recipe in the photo below. You can make them ahead and freeze them too! I used unsweetened Coconut Flake whereas the Contessa calls for sweetened. I think ours came out delicious. Pull them just when the coconut stars to get slightly golden. You can't miss! 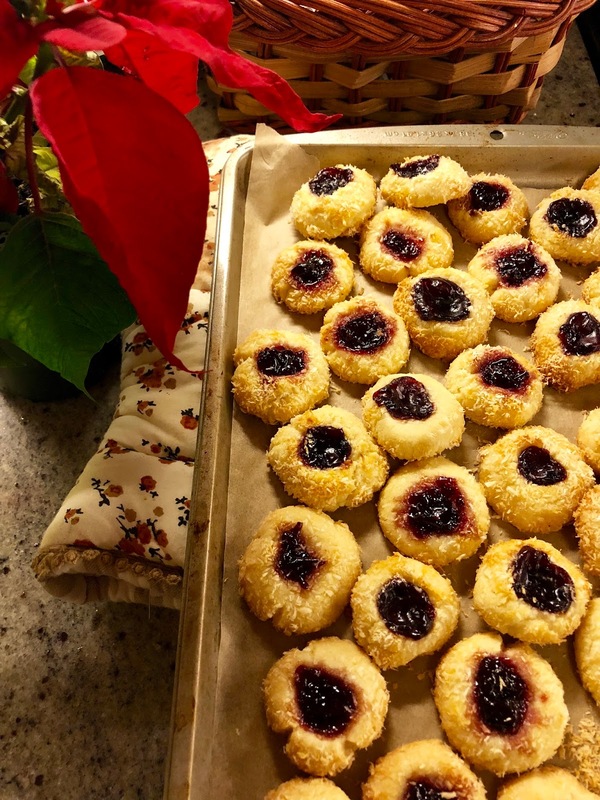 Ina's Jam Thumbprint Cookies - Click HERE for Recipe! Next up, with all sugar and holiday treats around, I set out to bake an ever so slightly more virtuous treat for my family, one a little less sweet, maybe a little more biscuit like, but still satisfying over a cup of tea or, for the little one, a sippy cup of Milk. Arrowroot Flour always catches my eye in the health food store, and I've always been curious about it. Given this, it only made sense that I should try and recreate a childhood favorite, Arrowroot Cookies. Turns out Arrowroot itself is pretty interesting. A starch derived from tropical plants, Arrowroot Flour is known for being easily digestible and the plant itself was prized in ancient Central American cultures. Once I got my hands on a super simple recipe from another blogger, I was pleased both by how fast the easy dough came together, the equally quick bake time and of course the results. The original recipe from Someone's In The Kitchen Blog appears below with my only change, the addition of a 1/2 teaspoon of Cinnamon, a favorite spice in our house, and the fact that I used light brown sugar instead of dark. Either would work. Kids and adults of all ages will enjoy these simple, homey treats, and you will love the cost savings as compared to other kid's crackers. You could get creative and cut the dough into letter shapes, stamp it, decorate with a fork as I did, or even engage your kids in the effort. Enjoy and I hope the holiday season is as stress free and fun as possible! There are few things that make me happy about the end of summer, but the beauty of the fall season to come is one of them. With that comes great produce - Pumpkins and Pumpkin flavored foods get all the attention (or should I say, overexposure? ), but for me, the humble Fig is the most worthy harbinger of the changing season. Earthy green or purply brown on the outside and bright and beautiful on the inside, it's as if they carry the last of the sweet summer memories into the autumn the chill. If you you look back through Neurotic Kitchen's late summer posts, you'll almost always find a Fig recipe to try. This year's is the simplest, and was inspired by a decadent Grilled Cheese Sandwich I enjoyed from one of the food trucks at the lovely Hallockville Museum Farm Country Fair. Hallockville is a not-for-profit and working farm featuring landmark historic buildings. The organization seeks to "preserve and interpret the history of farming on the North Fork of Long Island." The Country Fair had lots of great food, farm-themed amusements for the kids, and lots of really interesting old-time tractors and farm equipment. This city girl was shocked by how much she enjoyed the antiques! If you have the chance, make sure to visit next summer. Anyways, on the drive home, we stopped by our favorite farm stand where they were selling some really good looking, ripe black figs. Seeing as I can almost never resist them, I just knew they'd need to be worked into our dinner somehow. The next stop was to the supermarket where I grabbed a log of Brie and, when additional inspiration struck, some sliced Brioche. What followed was one of the easiest and yummiest pre-dinner bites I've had in a while. I hope you enjoy as much as we did! Hollow out the Brie Log or wheel and reserve the soft inside in a bowl or on a surface until it reaches room temperature. Just as you would a grilled cheese, butter both sides of each slice of Brioche and lightly toast until one side is deeply golden and close to fully toasted. Lower the flame all the way. Remove Brioche to heatproof surface, toasted side up. Lightly spread each slice with optional Fig Preserve (a thin layer) and a healthy amount of Brie. Butter the griddle again and return the toast, Brie Side up to the griddle where you'll heat until the Brie Fully Melts. 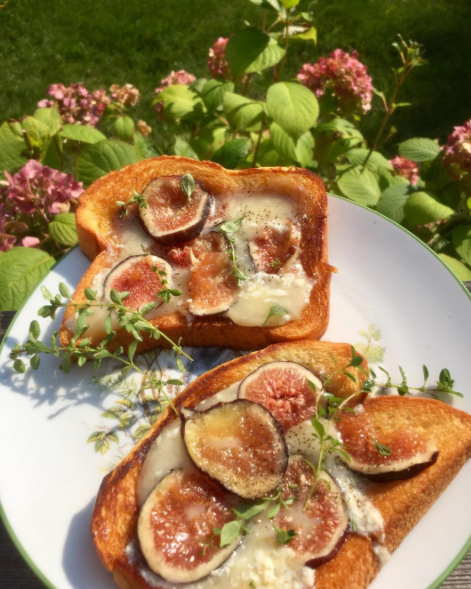 Remove toasts and top with slices of Fig. Now give them a light sprinkle of Sea Salt and a garnish of fresh Thyme Sprigs (with a few of the leaves removed and scattered on top. Enjoy! Neurotic Kitchen Tip: This would make for a great brunch dish too! The summer heat is on full blast and you are, no doubt, in need of some refreshment. At least that's how I felt when I decided to use the overflowing bounty of my herb garden to jazz up a cold glass of Iced Tea - one of the many simple pleasures of the season, I am sure you'll agree. If you've ever included Mint to your garden, you know that it is prolific, growing and spreading like a weed as it takes over everything in its immediate proximity. 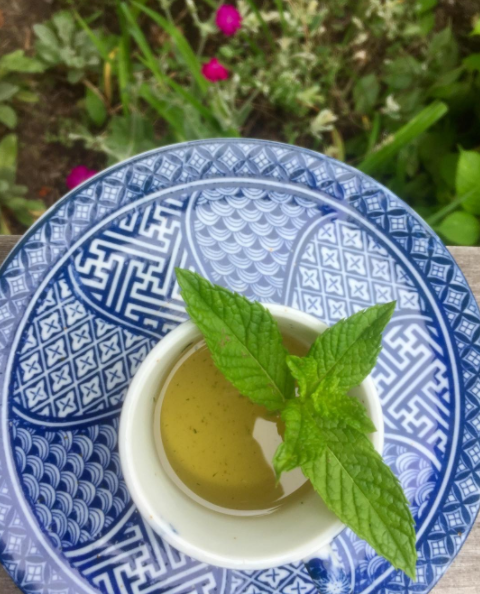 Looking for a practical way to capitalize on this abundance, I decided to find a Mint Simple Syrup Recipe. The process took just about 15 minutes (including washing and chopping the Mint) and the results were delicious - Simple Syrup can be used in Cocktails (the possibilities are really endless) and Mocktails and as you've probably guessed, it was an awesome way to add extra flavor and sweetness to home-brewed Iced Tea. Last week's journey to London was our first trip across the pond in several years, which makes me all the more excited to chronicle some of the highlights as I've done for many of our past travels, domestic or international. 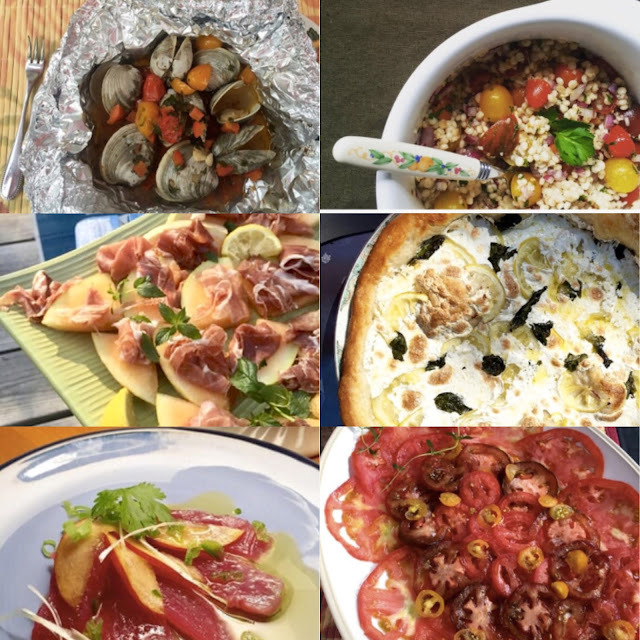 For more on some of the highlights (food or otherwise) enjoyed during our previous jaunts, click below. 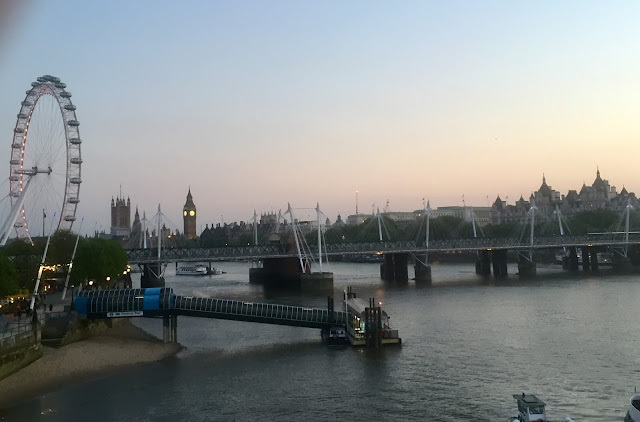 Though the primary purpose of this trip was work, I am so glad that while I headed out to the office, scenically located near the Thames by gorgeous St.Paul's, my family was able to enjoy the sights in lovely London, even if we did have a few rainy days in between. As for myself, it was a pleasure to take in the city through adult eyes, having last experienced it decades ago as a ten year old. 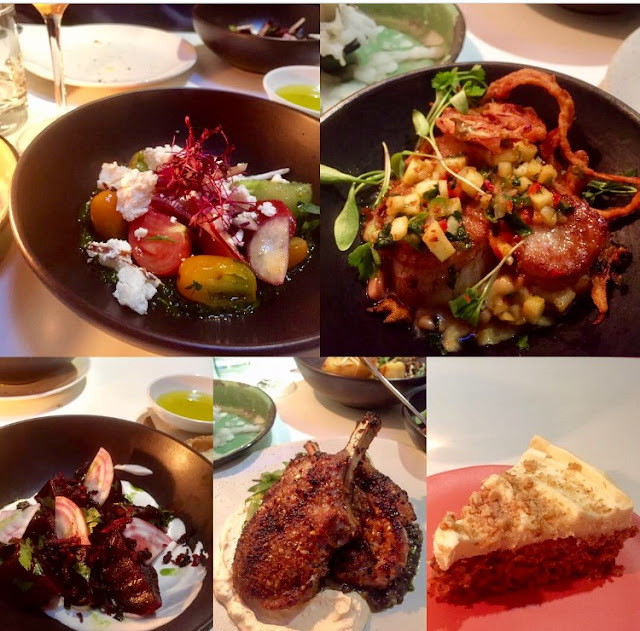 As far as culinary highlights, the undeniable winner was our trip to Ottolenghi in the Islington section of London. I have a real fascination with this amazing chef. From his gorgeous cookbooks packed with creative recipes built largely on Middle Eastern flavors, to his charming public persona and commitment to activism, there is nothing not to like about Yotam Ottolenghi. You'll find his restaurants in multiple locations across London, but if you make the trip to the Islington Ottolenghi, I can tell you you'll be greeted by a display window overflowing with sweet treats. Upon entering, you cannot help but feast your eyes on the counter offering an array of colorful and appetizing prepared foods. Continue even further and you'll discover the chic yet bustling communal tables in the back. The Ottolenghi dining format is small plates driven, allowing you to taste a great variety of creative preparations. I love this sort of meal as I am always wanting to sample more dishes than my stomach or wallet will allow. You'll also find lots of vegetable-centric dishes, so it's a great option for non meat eaters. Our dinner was mouthwatering start to finish, with almost all the dishes executed impeccably. Add to that friendly and approachable servers, and the fact that this was the scene of our first taste of orange wine (I cannot believe I've lived my life never discovering this wonder), and it was a memorably dining experience through and through. Luckily, I was able to discretely capture some photos for you. 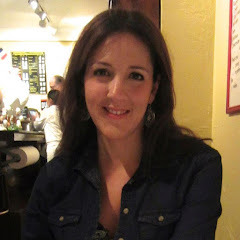 We surely enjoyed some other very solid meals, with a strong honorable mention going to Cote Brasserie (a reliable chain - we visited the charming Marylebone location) where we dined on quite a lovely bistro meal. Similarly, Osteria Antica Bologna in bustling Clapham (a quick overground rail trip outside London) offered a delicious Italian meal and endearing service. Special thanks to our two sets of lifelong friends for hosting us at both venues, and in their lovely homes. 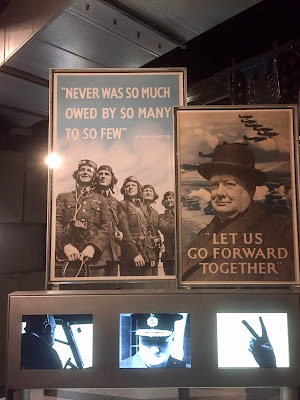 As for the rest of our trip, we were able to pack in some of the enumerable sights that London and its surrounding areas offer, from a visit to Greenwich by boat, a trip to the Natural History Museum, to the Temple Church and the absolutely not to be missed Churchill War Rooms (the latter two to the particular delight of my inner history nerd), there was certainly something for everyone. 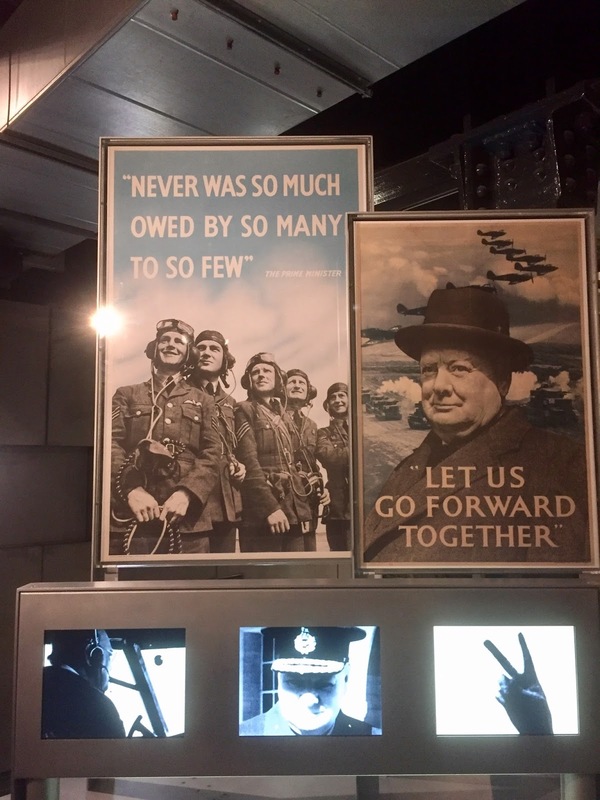 Thanks to all our friends and colleagues for an amazing trip and until next time, London! Mint, lemon and chili together are a very classic Italian flavor combination. They also happen to work deliciously together with seafood. This incredibly easy and company-worthy Pasta dish is an excellent choice if you are looking for an entree that is zesty, light and comforting all at once. At well under 30 minutes to prepare (if you get the Shrimp cleaned in advance) it's also doable on a weeknight. 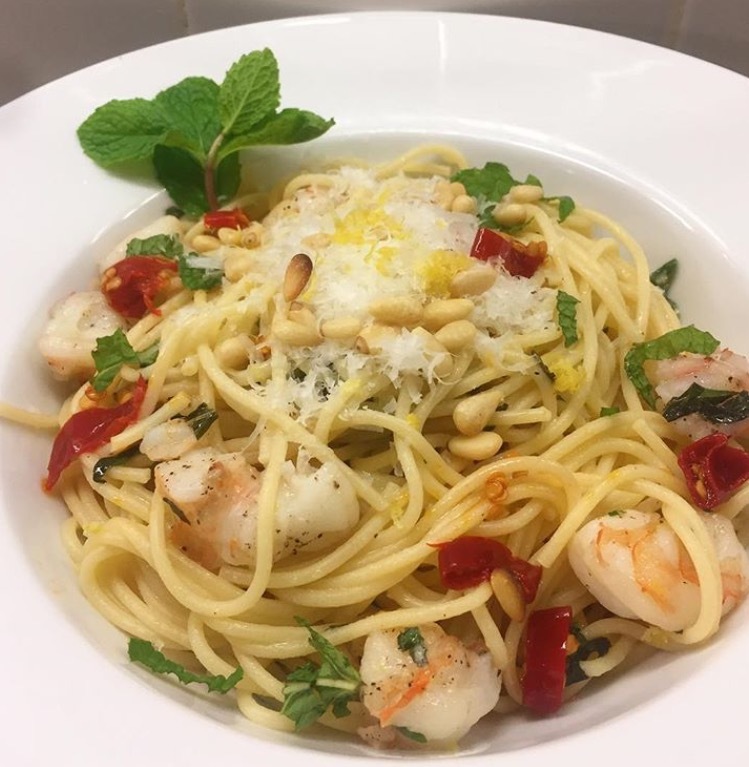 I know Spaghetti with Shrimp, Lemon, Mint and Pecorino is definitely going to be a regular on our summer menu rotation. Try it today and buon appetito! Prepare Pasta as directed in well-salted water. Reserve 1/2 Cup Pasta water, drain and set the Pasta aside. Meanwhile in a large skillet, warm 2 Tablespoons of the Olive Oil over medium low heat and add the Garlic Cloves. Cook, stirring until slightly golden, for about 5 minutes. Discard the Garlic. Sprinkle Shrimp with a little Salt and Pepper. Add them to the skillet and cook about 2 minutes until almost totally opaque. Add the Pasta, Water, Lemon Zest, Lemon Juice, 2/3 of the Pecorino Cheese, and the 2 remaining Tablespoons of Extra Virgin Olive Oil. Cook, tossing constantly until the sauce thickens nicely, about 2 minutes. Season with a bit more salt and stir in the Calabrian Chili. Plate and garnish with remaining Pecorino, toasted Pine Nuts and Mint Leaves. Enjoy! As long as I can remember, Easter has always been my absolute favorite holiday. For me, it's a day already so filled with hope, joy and a sense of renewal. It also coincides with spring, a season of rebirth itself, one signaling that summer is right around the corner. Last but not least, with the exception of delivering some baskets the Easter Bunny may have dropped off for the little ones, Easter isn't saddled with all the pressures gifting that plagued Christmas. No, in my mind, Easter is just perfect - right down to the menu. This year, we went with the very traditional Lamb main. It was warm enough to grill outside and my husband cooked it perfectly. We adapted a great recipe for full racks (vs. sliced up chops from the rack) and drizzled it with a Greek lemon sauce called Ladolemono before serving. This would be a winner any time of year and it was so easy. Find the recipe HERE. 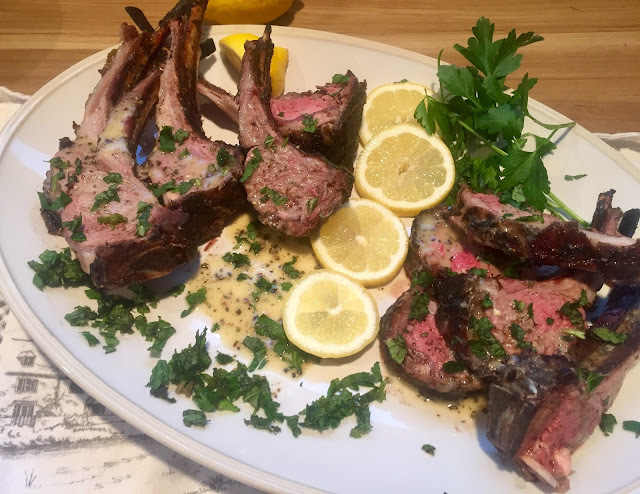 Amazingly easy Lamb that we adapted Michael Psilakis' recipe by upping the grill time for a few full racks vs.
individual chops. Simple Ladolemono (a Greek Lemon Sauce) provides a little extra brightness to this rich dish. 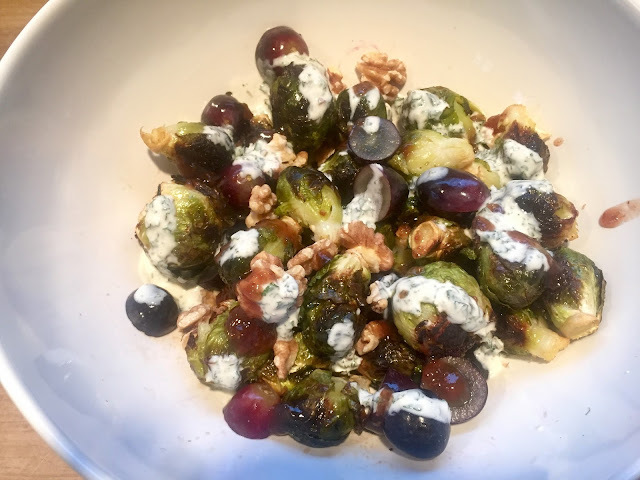 For a great side, you can't go wrong with our ilili Brussels Sprouts, a sweet, savory and tangy dish inspired by an amazing Lebanese restaurant in NYC by the same name. Finally, I adapted a much more technically complex (and phenomenal looking recipe for Sabzi Polo, Persian Herbed Rice served in a slightly molded form with a crispy crust on its outside) by playing off many of its flavors but presenting it more as a traditional (and far faster and easier) Rice dish. One day I will try the real thing but this meal was all about speed and ease despite the significant amount of time it took me to wash, chop and prep the many herbs that went into our meal! of the same flavors and folding them simply in a basic rice dish. The recipe follows below. I hope you enjoy the easy recipe below. And don't wait until next Easter to try it! 1. Prepare Basmati Rice as directed in Water, cooking until just the tiniest bit underdone. 2. As Rice cooks, heat Salted Butter in a small pan and saute minced Garlic a few minutes until soft and fragrant but not browned. Turn of the heat. 3. In another small pot, heat the Saffron threads over medium heat in 1/3 Cup water until quite hot and water becomes deeply colored, about 5 minutes. Allow to sit. 4. 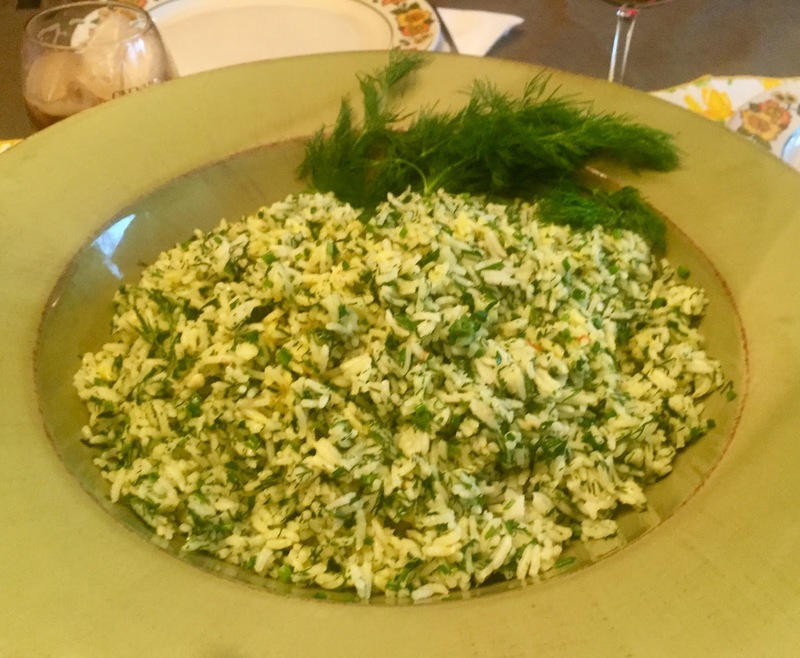 Fluff the Rice and carefully fold in all the Herbs, the Butter and Garlic, and toss gently adding the brewed Saffron liquid and distributing it throughout, reserving a small amount for serving. Follow by drizzling in 1/4 Olive Oil. Stir to incorporate. 5. Finish by adding 1/2 teaspoon Salt and then combine. 6. Taste and adjust Salt as needed. 7. To serve, remove to a serving bowl and drizzle with remaining brewed Saffron. 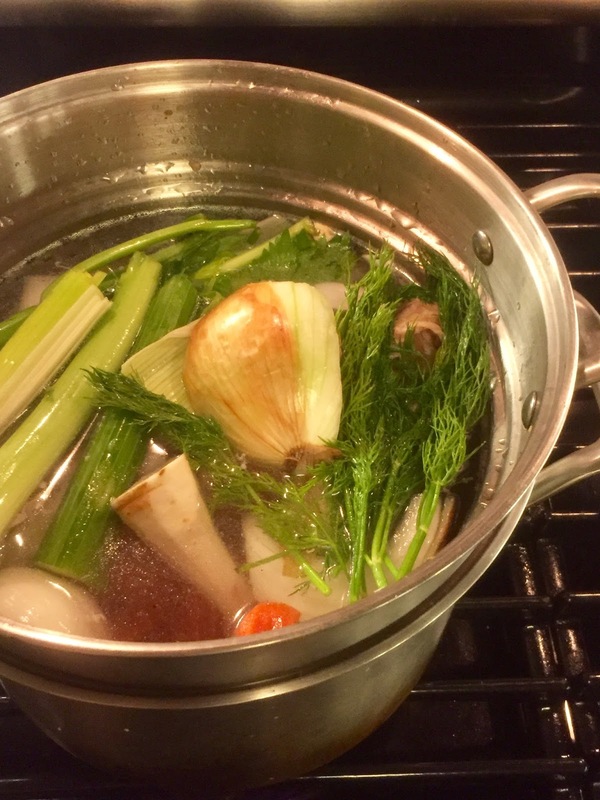 Garnish with leftover herbs and enjoy!